Shockingly, when snowed in, people want to get drunk. At least that’s what the results of the last poll indicate. An overwhelming amount of people (51%) wanted me to make something with booze in it! I actually already made something with booze in it this week, but I know that you guys were expecting a beverage. I wanted something warming but I wasn’t really in the mood for something hot. Does that make sense? I came up with this port punch that very easy to throw together and is very tasty. This could also be called Cheater’s Sangria. It tastes a lot like sangria which makes sense since Port is red wine that’s been fortified with Brandy. Most sangrias (including the white variety) are beefed up with brandy or rum or some other kind of hard liquor, but if you use port than that extra booze is already included! This could also be called Cheater’s Sangria. 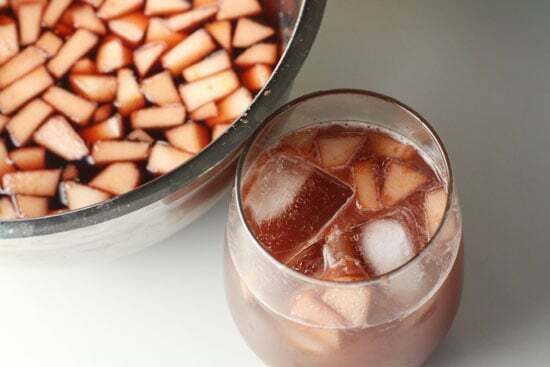 Marinating fruit in port and then mixing it with some juice and ginger ale makes for a perfect punch! 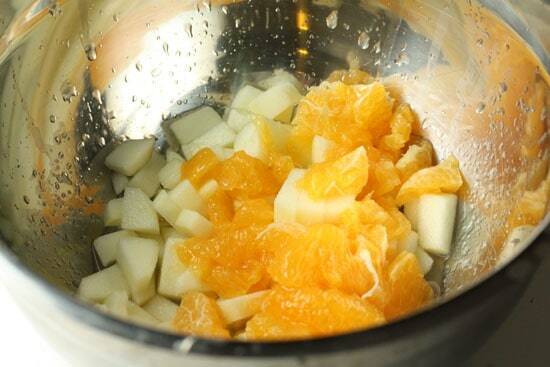 1) Cut segments out of oranges. Peel and core the apples and dice into chunks. 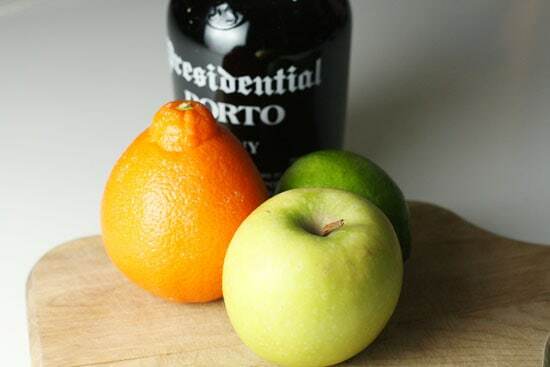 2) Add fruit to a bowl with lime joice and port. 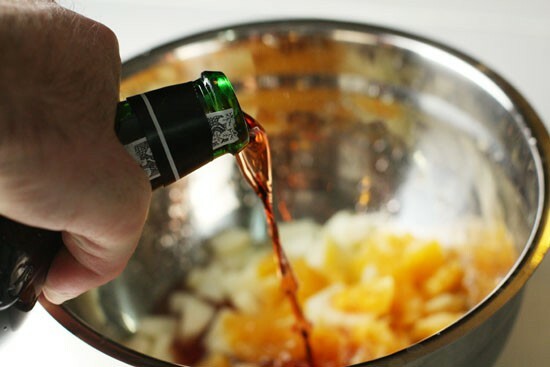 3) Let marinate for 1-2 hours or overnight. 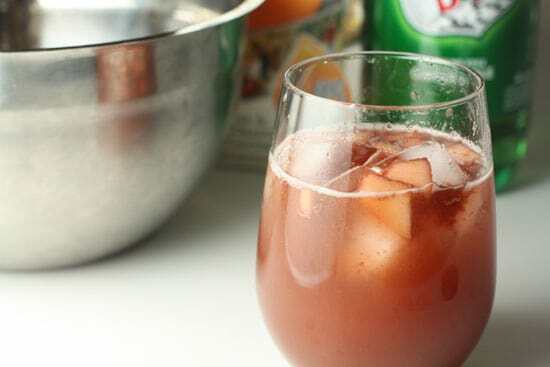 4) Mix 2 parts of the port mixture with 1 part OJ and ginger ale in a tall glass with ice. I kept the fruit kind of minimal for this version because, frankly, it’s all I had! You could go crazy though with pears, berries, grapes, etc. 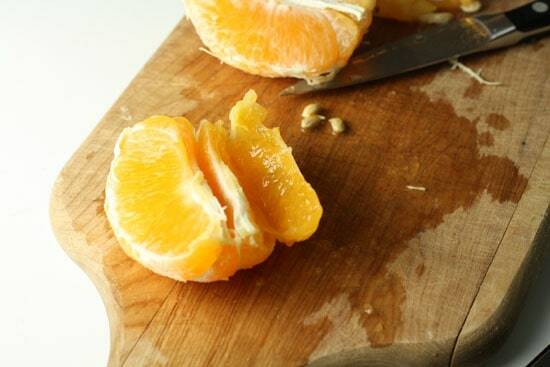 When prepping your fruit, try to just get out the segments from the orange. You don’t want the white casing part which will be kind of bitter in the final drink and also hard to chew. If you take a sharp paring knife and slice down each side of the segment, you should be able to just pop each segment out. You just want the pulpy stuff. Also, peel and core your apple and then dice it up into tiny chunks. Add all that fruit to a bowl along with your lime juice. Now you could just let this marinate for an hour or two, but the longer the better. I let mine sit overnight in the fridge and it was great! When you’re ready to serve, you just need some ice, OJ and ginger ale. I decided to mix mine up a cup at a time, but if you’re serving a crowd you could definitely mix up a big punch bowl and then just ladle the punch into glasses with ice. 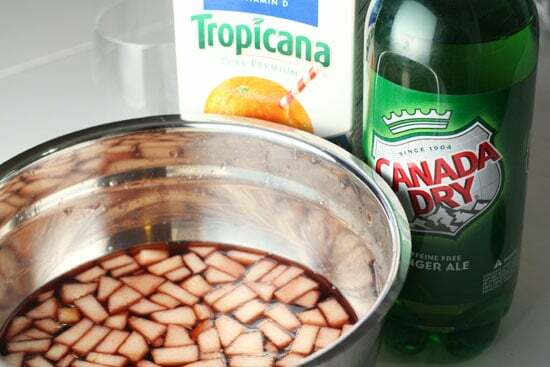 The orange juice and lime juice do a great job of cutting the sweetness of the Port and the ginger ale gives it some good bubbles. I was kind of worried when I started making this mainly because Port is one of my most favorite drinks. The idea of wasting a bottle of it on a bad drink was scary to me! Luckily, this stuff turned out great. 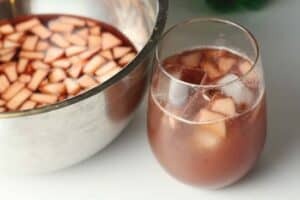 It tastes basically like sangria without the need for all the individual liquors! I like this idea, the drinking during snow storms. And, the port and such is clever. Have you ever heard of Fish House punch? Google it. I made it once years ago. It's the kind of punch to serve the neighbors when no one can DRIVE anywhere. I am all for cheating-drinks! I love port… and brandy! My default right now is the classic sidecar… oh yeah. I made this and served it at my New Years Eve party last night but WARMED UP! It went down a treat; so many compliments.